Blue lacy dog; photo by TrueBlueLacys on Wikipedia (use permitted with attribution / share alike). The Blue Lacy dog breed was developed in the mid 1800's by the Lacy Brothers of Burnet County, Texas (Frank, George, Edwin, and Harry Lacy). The family is said to have used greyhound, scent-hound, and coyote stock. The Blue Lacy is officially recognized by the National Kennel Club (NKC). 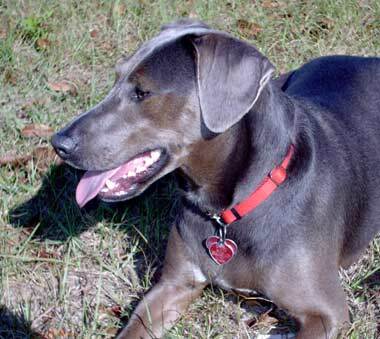 The Blue Lacy has a smooth, sleek coat (usually gray, sometimes red or cream, with some white on the chest and sometimes on the paws). Adults are 18-25 inches at the shoulder and weigh 25 - 50 pounds, with unique yellow to orange colored eyes. The blue lacy has a natural herding instinct which enables it to work everything from chickens to the toughest Texas Longhorn cattle. The breed is known to be extremely intelligent and very easy to train. RESOLVED, That the 79th Legislature of the State of Texas hereby designate the Blue Lacy as the official State Dog Breed of Texas. 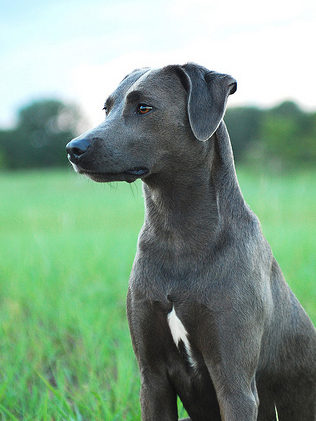 Blue lacy dog; public domain photo by Brooke Shaw on Wikipedia.